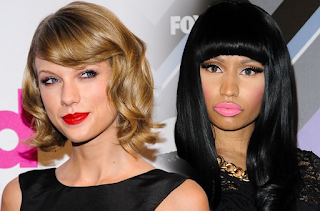 Taylor Swift checks Nicki Minaj over MTV Video Music Awards rant. Pop star Taylor Swift has hit back at Nicki Minaj after the rapper missed out on the Video of The Year nomination at next month's MTV Video Music Awards. A disappointed Nicki wrote on Twitter: "If your video celebrates women with very slim bodies, you will be nominated for vid of the year." Shortly after Taylor, who is up for Video of The Year, Best Female Video, Best Pop Video and Best Collaboration, replied: "@NickiMinaj I've done nothing but love and support you. It's unlike you to pit women against each other. Maybe one of the men took your slot..."
Nicki then said: "Huh? U must not be reading my tweets. Didn't say a word about u. I love u just as much." She added: "But you should speak on this @taylorswift13."